In the modern day, the staircases are used to add to the elegance and beauty of a home. Although the concept of stylish stairs has been around since ancient times, but it requires additional space to build a chic staircase for a home or workplace. The staircases range from simple & functional to the classy and elegant ones. People who are more inclined towards classic interior, usually design infrastructures that are based on staircase they choose, in order to create design harmony across the entire space. 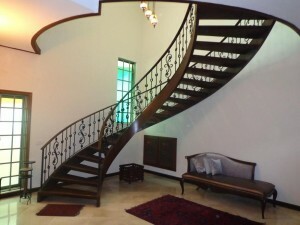 Pakistan’s leading architectural design and construction firm AmerAdnan® emphasize the importance of staircases in a home’s interior design and have also designed many unique types of staircases for their clients across the country. 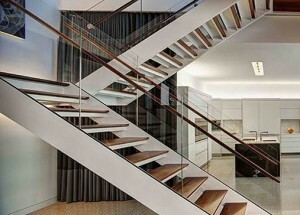 The modern genesis staircase, as the name and picture suggest, is one of the most stylish in the modern day. This intricately designed double helix staircase not only has an awe-inspiring look, but is also very durable. The modern genesis staircase is not only used in big houses, but can also be an ideal choice for the smaller living spaces, as it does not consume much space. Also known as the triangular floating treads, this staircase is one of a kind and is suitable for large as well as small houses. The glass panel railing in a triangular floating treads staircase not only makes it look more appealing but also adds a lot to the look of a space. For those who are more inclined towards wooden railing can replace the glass railing with stylish wood panels. 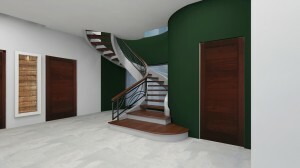 This contemporary staircase design is minimalist inspired giving simple, yet elegant look. This staircase is made out of wood that is stringed up by non-structural cables to ensure maximum protection and provide support to the treads. For intricate and smaller homes, the minimalist inspired staircase is a great choice. The most popular across residential buildings is the traditional floating staircase. 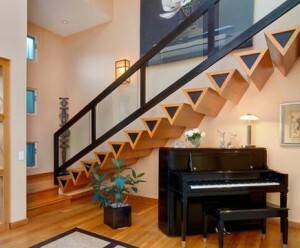 This staircase type not only adds to the beauty of a space, but also provides great convenience. Not only in the older, but in the modern house designs in Lahore, we see a lot of traditional floating staircases. This staircase is safe for all age groups and makes it easy to climb up and go down. The railing is usually made out of wood, whereas the iron bars below the railing are usually in line with the theme color of the home. The stair treads are either made of marble or wood, as per different preferences. With a free standing staircase that comprises of glass balustrade and floating steps, you can give your home the unconventional and contemporary feel you are looking forward to. The combination of white and wood finishing of the steps makes it completely blend with a home that has white walls and woodwork in the form of wall panels and fixtures.